This is the "Carlito" art of going from the farm and ocean to the table with an emphasis on Japanese style seafood cuisine. Travel to exotic locations meeting local merchants and many good friends all while gathering fresh, delicious ingredients for his recipes. Carlito meets up with Captain Guillermo in Puenta Abreojos famous for its Abalone. The fishing Co-op here protects and manages all collecting of the Abalone and shares their techniques with Carlito. Heading to a colder region of the Northwest, Carlito joins friends in a beautiful cottage of the Hood Canal in Washington. Carlito travels to Magdelena Bay on the Pacific Coast of Baja Sur to meet up with a band of feisty Crabbers to hunt for delectable mollusks to prepare a fresh Saffron Seafood Paella. It is close to opening night of Lobster season and Carlito joins his friend Enrique to sail to the island of Catalina off the coast of California to dive at midnight for lobster. Carlito visits his "early years" turf area of San Francisco where he connects with two old friends who share his passion for fishing. Carlito's Cooking Adventures is a unscripted television show with Chef Carlito Cham. Carlito Cham is the owner and chef of Carlito's Place in Pescadero, Baja California Sur, Mexico. He was raised in La Paz, Mexico and grew up in the restaurant business. 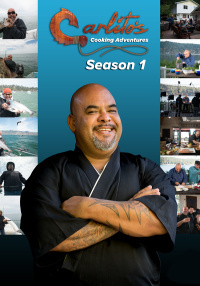 As a featured chef for four years on the highly successful Offshore Adventures cooking show, Carlos honed his skills in front of the camera. With a huge personality, a penchant for adventure, and skills as a world-class chef, Carlito takes exquisite cuisine and makes it accessible and fun on Carlito's Cooking Adventures. This series incorporates hunting and gathering with how-to instruction on creating beautiful cuisine from the land and sea. In this show you will see many exciting segments ranging from free diving for big fish in the sea of Cortez, to gathering up clams and octopi along the coast and also seeking the best quality farm meats and vegetables the land has to offer. With them, Carlito will show you how to prepare delicious and beautiful dishes that you can make at home. Carlito's Cooking Adventures will take you traveling to exotic locations of Baja and around the world, meeting local merchants and many good friends all while gathering fresh, delicious ingredients for his recipes. This is the "Carlito" art of going from the farm and ocean to the table with an emphasis on Japanese style seafood cuisine.